Eyelash transplantation can be used to enhance short, thin, spare or otherwise ‘weak’ lashes. For some patients, the overuse of eyelash extensions can cause permanent eyelash loss resulting in the need for eyelash transplants. It is assumed that this eyelash-loss is a result of a form of ‘traction alopecia’–similar to the damage to scalp follicles from tight braiding, hair extensions or chronic hair-pulling. Dr. Bauman recommends gentle placement and removal of eyelash extensions by a trained and certified professional to prevent damage to your eyelashes. Should eyelash damage occur, it might be temporary. After six to twelve months, eyelash growth should ‘rebound’ somewhat if the damage is not severe. 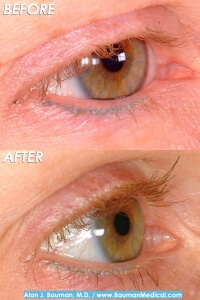 If the eyelash damage is permanent, eyelash transplantation can be used to replace lost lashes. Every month, patients–like Sharon, below–come to Dr. Bauman with damage from their eyelash extensions. One of the main criticisms of eyelash transplantation procedures of years ago was that there was poor control over the orientation, direction, curl and position of the implanted lash follicles. Dr. Bauman’s refined approach, as demonstrated at the First Regional Live Surgery Workshop on Eyelash Transplantation, allows precise control over these factors. In Sharon’s photo to the left (with no mascara) you can see the exact position and curl of the implanted lashes. Notice the increase in density precisely at the lash margin as well as the appropriate curl of the transplanted lashes in the ‘After’ photo. 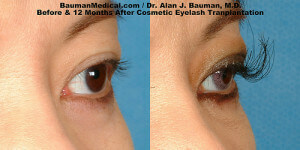 When performed properly, transplanted lashes look natural and beautiful, enhancing your eyes and your face. Before & After 12 months. 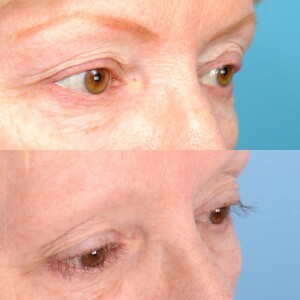 Not all patients want a dramatic “Hollywood” look to their eyelashes, but it’s certainly possible using eyelash transplantation. 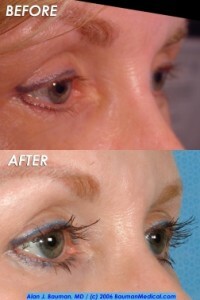 Transplanted lashes can be trimmed to whatever length you desire: subtle or dramatic! Photos taken before and 12 months after eyelash transplantation by Dr. Alan J. Bauman of the Bauman Medical Group. 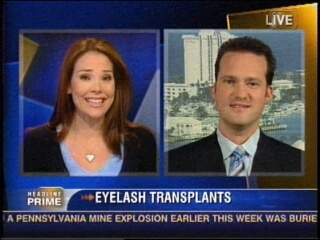 In 2004, Dr. Bauman implanted dozens of lashes into each upper lid. 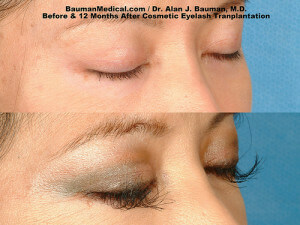 Note: Transplanted lashes need to be trimmed (and curled) routinely. 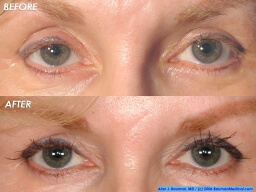 Before and twelve months after eyelash transplantation of the upper lids. 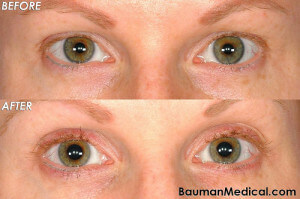 Dr. Bauman transplanted well over 100 new lashes into her upper lids. Notice the dramatic increase in density and length of the lashes. Patients suffering from active eyelash trichotillomania or hair-pulling disorder are not good candidates for transplants–they will pull the transplanted lashes! However, many recovered trichotillomania patients have had successful, long-terms results from eyelash transplants. This Bauman patient, Hilary, recovered from trichotillomania decades ago and recently got her wish of growing her own eyelashes back once again. Hilary was a featured eyelash transplant patient at a recent International Society of Hair Restoration Surgery Live Patient Viewing Session at the Annual Scientific Meeting in Chicago 2015. 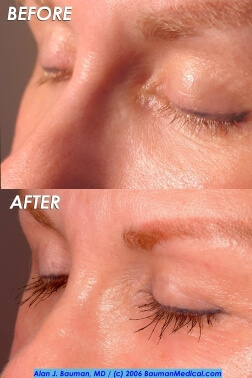 After eyelash transplantation, many patients want to have an ‘eyelash manicure’ which includes trimming, tinting and perming of the transplanted lashes. We offer these services by appointment at Bauman Medical Group. This is a photo of Erica Lynn (professional model and eyelash transplant recipient) receiving an eyelash-manicure.Erica Lynn’s eyelash transplant procedure by Dr. Bauman was featured on Good Morning America and Extra!. Her eyelash-manicure was seen on NBC’s Today Show.